On this week's brand new edition of Rapidly Rotating Records, we're going to do all sorts of things, including go down by the sycamore tree, visit the woodlands, get reckless and hear from some sisters. 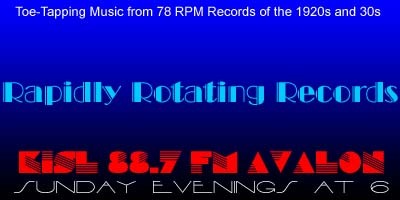 And, there are several 78RPM records making their Rapidly Rotating Records debut on tonight's show. I'm Going Down To Dance At Clancy's – Richard Himber and His Ritz-Carlton Orchestra / Joey Nash, v.
I'm Going To Park Myself In Your Arms – Ted Weems AHO / Dusty Rhodes, v.
Reckless – Richard Himber and His Ritz-Carlton Orchestra / Stuart Allen, v.
Lucky Little Devil – Jack Albin AHO / Danford Sisters, v.
What Would Happen To Me (If Something Happened To You?) – Isham Jones AHO / The Three X Sisters, v.